Now, in discussing the stated $71,860 retail value of the 2014 Chevrolet Corvette Stingray, we should point out that very little is known about the car that carries that price which is why our title includes the pesky little asterisk. General Motors is currently running a simple contest to give away a 2014 Corvette Stingray and in the contest legalese, it clearly states that the approximate retail value of the Corvette being given away is $71,860. This is really the first pricing of any kind that we have seen on the new Stingray and after Corvette chief engineer Tadge Juechter stated that if you can afford the current Corvette…you can afford the Stingray. However, a price in the ballpark of $71 grand is a massive jump from the $50,595 base price of the 2013 Corvette but is GM going to give away a base model 2014 Stingray? Probably not. If I had to guess, I would expect that the winner of the contest would get a heavily loaded up 2014 Stingray similar to the cars that have been on display at the various auto shows since the Detroit debut in January. When you consider the fact that the 2014 Chevrolet Corvette has almost exclusively been displayed in what appears to be fully loaded form including a loaded up interior and the high performance Z51 handling package, that $71k price tag becomes a bit more reasonable. While the base 2013 Corvette 1LT starts right around $51,000, the top of the line (excluding the Grand Sport, Z06 or ZR1) Corvette 4LT starts at $60,090. Add metallic red paint and that price jumps to $61,085 while chrome rims bring the price up around $63,000 and should you add body colored roof panel, the Magnetic Ride Control suspension, cross drilled brakes and red brake calipers – the price reaches almost $67,000. Unfortunately, the Z51 handling package is not listed for the 2013 Corvette so it is hard to guess how much that might add to the unknown base price of the 2014 Stingray. However, when you consider the fact that the 2013 Corvette Grand Sport (a loosely comparable package to the base Corvette with the Z51 package and some other added goodies) has a starting price of $66,490 all loaded up (4LT) – that $71,860 retail value becomes a great deal more realistic. If you configure a 2013 Grand Sport 4LT with chrome rims, crystal red paint, Magnetic Selective Ride Control, dual mode exhaust, red brake calipers and the removable roof panel; the price of the 2013 Grand Sport 4LT climbs to $73,715 while picking the automatic transmission brings the price to almost $75k. Now, what might that $71,860 retail value of the 2014 Chevrolet Corvette Stingray include, you ask? In terms of performance, we are guessing that it will come fully loaded which could include things like the unique wheels, the high performance tires, the revised suspension, the improved cooling channels and the braking system of the Z51 package along with a dual mode exhaust system and the possibly the Magnetic Ride Control suspension system. As we pointed out above, those features can quickly get the price of the Corvette 4LT up around the $70k mark. Inside, the 2014 Stingray being given away will almost certainly feature a top of the line (think 4LT) interior with leather everything, the new sport steering wheel, the Competition seat option, the premium infotainment system and of course the standard removable roof panel. The contest fine print also doesn’t specify coupe or convertible and with the droptop 2013 Vette 4LT starting at $67,090, the stated price of the 2014 Stingray could include the possibility of the winner picking a convertible. One other important thing to keep in mind is that with contests like the one giving away a 2014 Chevrolet Corvette Stingray, the legal fine print generally includes the approximate retail value at its highest possible level. This means that the price of $71,860 likely includes things like a upcharge for paint and wheels, an upcharge for the automatic transmission, an upcharge for the convertible option and other various charges that drive up the price that may not be selected by the winner. In short, if the winner of the contest picks a loaded up 2014 Stingray Coupe in black with standard wheels, the base GT seats and no other pricey options, the retail value of the grand prize vehicle would actually be lower than the stated value in the fine print. What this approximate retail value of the 2014 Chevrolet Corvette Stingray is likely showing us is not where the Stingray will start in price but rather, that number of $71,860 could be the most expensive possible configuration with all of the current options taken into consideration. 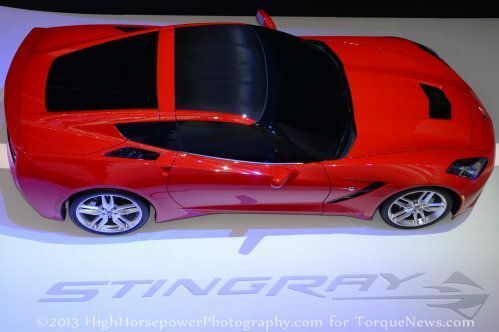 Should that be the case, the 2014 Stingray Coupe sans the Z51 package and all of the interior goodies could very well be much closer to the $51k base price of the current Corvette. Now that we have looked at how the 2014 Chevrolet Corvette Stingray might cost $71,860, click here to head to the GM RaceToWinCorvette website where you can enter (for free) to win both a new Stingray and a trip to the 24 Hours of LeMans. I’ve already signed up and it is very easy…well worth the time for a chance to win a new Corvette and a trip to see one of the most famous races in the history of motorsports. A special thanks to Max for the heads up on the price - and on the chance to win a new Corvette! Too much. Let's hope it is wrong. but its not a vette its still just a camaro!!!!! I wonder how the sales of this Corvette are going with this price after two years. Has anything changed in price since the start?